South Sudan rebels allied to the country’s ex-First Vice President, Riek Machar have confirmed the capture of 14 government officials, but vowed not to release them. A spokesperson for the rebel group, in a statement, claimed the captives were a security threat and will be treated as war criminals. Col. Paul Lam Gabriel said their forces remain in full control of Akobo county and its surrounding areas, adding that their forces remained on high alert in the wake of Saturday’s attack by government forces. “Akobo is under the control of SPLA-IO [Sudan People’s Liberation Army-In Opposition] not the Juba regime and, so any government agent sent by [President] Kiir elements is considered an enemy and will be dealt with according to rules and regulations of the SPLA-IO,” he said. 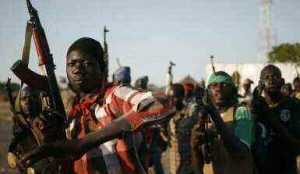 The South Sudanese government on Saturday called for the “unconditional” release of 14 officials captured by rebels on Wednesday near its border with Ethiopia. Dickson Gatluak, a military spokesman for the armed opposition faction loyal to the First Vice President, Taban Deng Gai, said armed youth linked to exiled rebel leader, Riek Machar detained at least 14 members of the peace delegation in Akobo county, Bieh state. «SPLA-IO is calling for the unconditional release of 14 members of peace mission delegates who went to Akobo purposely to embrace and disseminate peace messages,» Gatluak said in a statement. «These persons are not for military mission but civil administrators who are there on the ground for peace,» he added. Among those held captive, he said, is the commissioner of Akobo county, Tut Chai Riek, stressing that all the detainees’ are civilians. The South Sudanese civil war, now in its fourth year, has killed tens of thousands of people and displaced millions since its eruption in 2013. But a peace agreement signed in August 2015 between the country’s warring parties led to the formation of the coalition government.